Qwest Energy announces a new low-cost fuel tariff, making it one of the lowest priced energy tariffs in the region. The Qwest Energy September 21 tariff has fixed standing and unit rate charges to September 2021, meaning that customers have peace of mind about their energy for almost three years – meaning customers could see an average annual bill of around £1,017, and as the charges are fixed for the duration of the tariff, they won’t see unexpected price increases. “We are delighted with the announcement by Qwest Energy to introduce the low-cost fuel tariff. Currently the average fuel poverty measure for Cheshire West and Chester is 11.3% (11% across England) and this initiative will certainly go a long way in helping to support residents experiencing fuel poverty and the Council`s Plan for 2016-20 to eradicate fuel poverty in the borough. The Qwest Energy Community Fund also means long-term, stable funding for affordable warmth initiatives for households in the borough that are impacted the most by fuel poverty. 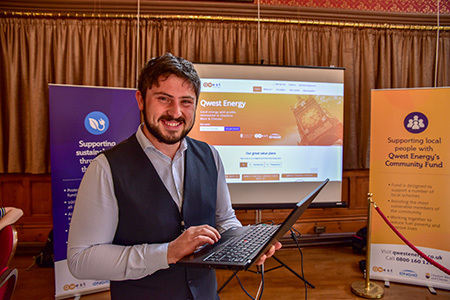 Michael Gibson, MD for Qwest Services, said: “By introducing the new low-cost tariff, Qwest Energy can offer competitive prices in the region and customers can help their community at the same time through the community fund. “Winter can be an expensive time with more money being spent on heating our homes. We hope this tariff will help lighten the load for the people of Chester and Cheshire West. For more information, please visit qwestenergy.co.uk, or call 0800 160 1240 for a quote and choose a tariff that suits. Engie Content Manager, Dan Young, shows how easy it is to switch.